it has been a week of cosy as a coffee maker. i tend towards being a percolator anyhow… but this week has been exceptional for constantly planning the next steps. sometimes i couldn’t sleep because my brain was going. even though i was sick and therefore relaxing, i was still at work. 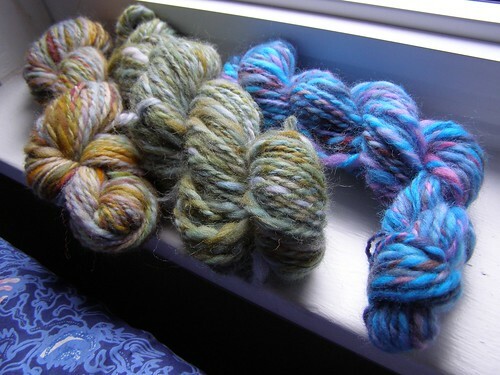 1) start selling my spinning at craft fairs, and maybe even my dyeing. with that in mind, on monday, while sick and grumpy i managed to figure out what was wrong with my spinning wheel and fix it! it had been having problems before we moved and i finally figured it out! hurrah! and here she is apart. it was gunky on the inside. that’s what i get for having a one-of-a-kind (as far as we know…) spinning wheel – lots of guess and check. 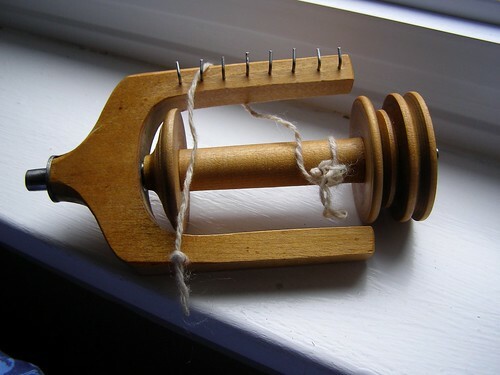 this new discovery also means that i can now get new bobbins made for this wheel, which is also exciting. so of course i’ve been spinning. one skein is too ugly to mention, because it is heading to be over dyed, but here are a couple i did in the last few days. i dyed them all. expect better shots once washed. 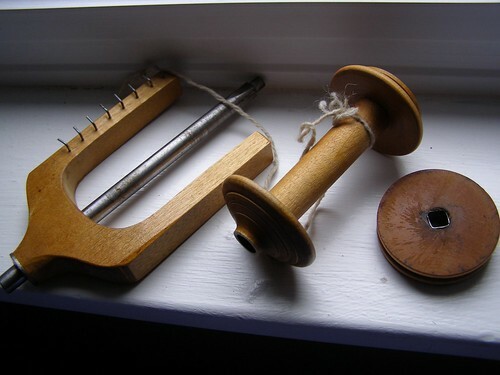 on that front, i also may have found someone to fix my country spinner (and maybe make me new bobbins for the little wheel?) and a farm nearby where i can get wool processed. i don’t want to say too much because who knows how fast any of this will finally get done, but things are looking up and, frankly, it feels so good to be spinning on my wheel again. as to dyeing, i have now figured out the ins and outs of our household and when the best time to dye is, so i should be getting more of that done. that’s on the back burner right now. 2) start writing up colorwork patterns – thus the mosaic from last entry. 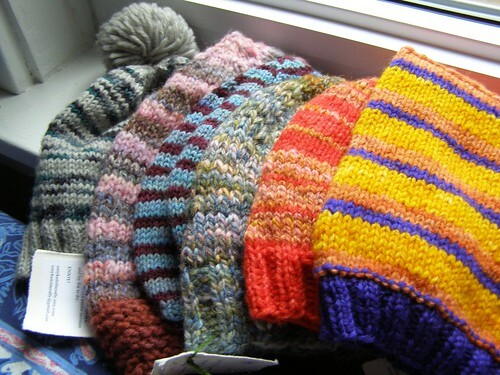 the non-colorwork hats seem to sell better than the colorwork ones do at fairs, but i have lots of interest in the colorwork ones as patterns. i’m also planning other patterns, but i’ll start with the colorwork ones. 3) embellish on everything. it’s what sells. so these hats will now be embroidered (or something) – hopefully by monday which is my next show. any comments and feedback would be great. thank you all in advance and thanks for sticking with the blog through all of this crazy business stuff. i hope to get back to ranting about wool and other misc. things very soon. This entry was posted in cosyknitsliterally, handspun, knitting, spinning by cosymakes. Bookmark the permalink. For the teaching, I would think a community center might be a good place to start–it would provide a location, and a vehicle for advertising (but you’d probably have to do a lot on your own, too, especially the first time around). There’s an organization here in Central NY called BOCES that offers vocational training as wells as leisure classes (including knitting, quilting, music lessons, yoga, etc.) I’m sure Pittsburgh would have an equivalent. Also, I wonder if one of the local thrift stores would host a “sweater ripping” workshop–it would mean one more reason for people to browse their racks. . .
i wish i lived close by so i could take you up on the teaching. i know i could learn so much from you. *sigh* anyway, i think that you should go on ravelry and maybe start your own club for your area and advertise that way for a start. i also think that maybe you could try your local library. i wish you so much luck. Consider contacting a community college. The one here offers “non-credit courses” that are part of the continuing education department. Adam teaches some introductory computer classes–mostly to older folks who just want to learn. Also, some craft stores that sell a variety of goods will offer classes in different areas. These would be the more local ones, instead of chains, though. The one downfall is that they tend to stock more of the “novelty yarn” acrylic stuff, since they’re not yarn stores. The one in Kalispell offers knitting and crocheting classes (along with cake decorating, painting, jewelry making, stained glass, and calligraphy!). I teach art in a public school district and they have a brochure of Community Education classes that they put out every Fall and Spring. I’ve been teaching knitting workshops through the Community Education program for a couple years, but you don’t have to be a teacher to do so. You might check with local school districts to see if they have anything similar. your yarn photos are so nice. i feel like i could feel the lovely textures! it sounds as though teaching is something that you have in your heart, and that you have been thinking about for a long while- see if you can contact a local community college (they’re called ‘polytechnics’ here) and offer yourself as a teacher. i really like the idea of you selling your patterns- i for one would buy them (i’m so looking forward to your book) and i think it makes sense to really capitalise on your skills in such a way that it doesn’t take up all your time. (i.e. making individual pieces- unless you can sell them for lots of $) i’ve been thinking about these sorts of things too- good luck with it all!